Presented below are the modeling methods used in GT-SUITE to simulate several key features. Generally, GT-SUITE implements one-dimensional flow simulation. Compared to full 3D CFD, this presents a very significant reduction in computational time, which is important as GT-SUITE simulates all components in the vehicle's systems. By coupling to an external CFD solver, GT-SUITE is also capable of full 3D simulation in select components of the system. Flow and losses in pipes are calculated based on well-known fluid mechanics relations, with the user given choices of several models based on accuracy required and computational resources. For example, for friction, options range from smooth wall assumption to Nikuradse and Colebrook equations with correction factors for varying geometry. Discharge coefficients model the losses of various geometry. Air boxes and air filters can be modeled as an assembly of pipes and flow splits with appropriately sized orifice. 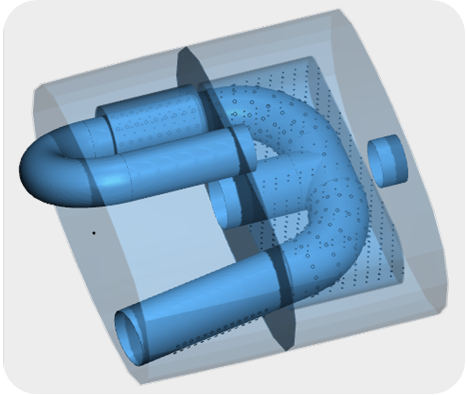 For increased accuracy, the GEM 3D tool can be used to model the air box in a CAD-like environment. The same method is applied for mufflers and silencers. Flows through piston are taken into account by a Poiseuille / Couette flow solution and so forth. GT-SUITE also accepts user-defined functions and tabulated data. In-cylinder flow is divided into several regions. At each region, the mean radial, axial and swirl velocities are calculated for each time step based on the geometry, piston motion and motion of incoming and exiting gases. A single zone turbulence and tumble model is also implemented. The in-cylinder flow simulation accepts swirl and tumble coefficients as functions specified by the user. In terms of scavenging in a two-stroke engine, the user can define a scavenging function that is obtained from either experiments or CFD analysis. As combustion modeling has significant impact on simulation results, GT-SUITE offers a wide range of modeling options. Options include non-predictive Wiebe models of varying parameters and assumptions, semi-predictive combustion models, predictive turbulent flame and jet models and homogenous charge compression ignition models. 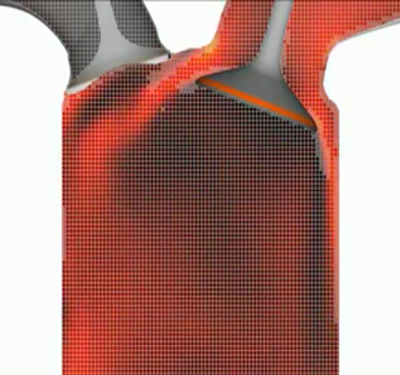 In addition, combustion can also be simulated with full 3D CFD simulation, with GT-SUITE being able to integrate with KIVA, Star-CD, FLUENT and CHEMKIN. User-defined combustion models are also accepted. For in-cylinder heat transfer, user may choose the model based on accuracy required and availability of data. The simplest case is imposing wall temperatures based on rules of thumb. User may also define the cylinder geometry and define coolant and oil temperatures and solve for heat transfer with finite element method. For better accuracy, user has the option to take into account or ignore fuel evaporation. For cooling simulation, three main options are available - non-predictive, semi-predictive and predictive. Non-predictive method imposes wall temperatures and coefficients; semi-predictive method takes into account the performance rate of heat exchangers; while predictive method simulates the fluid flow on the coolant side. Engine friction is modeled via empirical Chen-Flynn model with recommended parameters for approximating the friction of a typical engine. For better accuracy, laboratory measurements can be used to obtain more realistic parameters.